A couple of weeks ago, we had another one of those brocante sales in our neighborhood. I didn't find any Eames chairs this time, unfortunately, but I didn't return home empty handed. I bought the cutest, teeny tiny mother of pearl buttons! 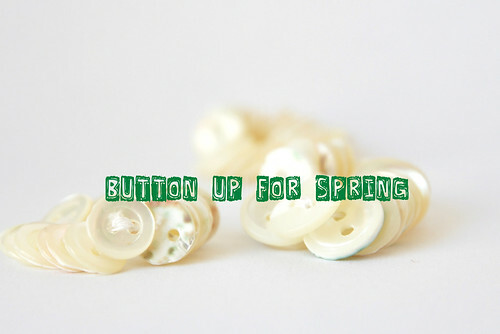 I love mother of pearl buttons and buttons in general, though I must immediately add that I don't like making button holes very much, especially not if there are a whole bunch of them as on a shirt. My mother of pearl buttons haven't been out of sight really since I bought them - I picked them up from time to time, thinking about the different ways I could use them. Michelle's bobby pins certainly were an inspiration. This is my favorite in the lot. 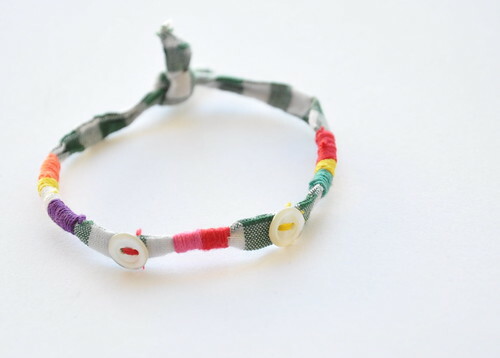 Cut a piece of fabric, about 2cm wide and long enough to go around your wrist. Fold in the same the way you would do for making biais tape and sew closed with a whip stitch, if you like. Wind embroidery floss around it in different colors. As easy as 1,2,3 - perfect for the kids to make on a rainy Wednesday afternoon (leave out the whip stitch in that case). 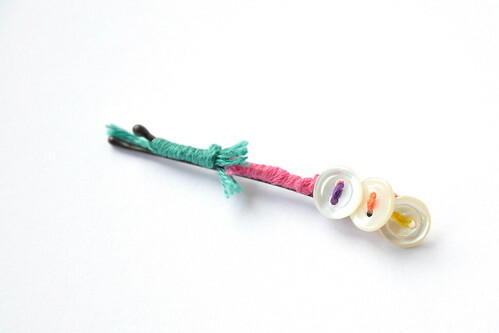 Cut of a strand of embroidery floss and tie it at one end of the bobby pin. Start winding the floss around the bobby pin (winding over the loose end to secure, if you like, which I didn't). Change colors as you go. 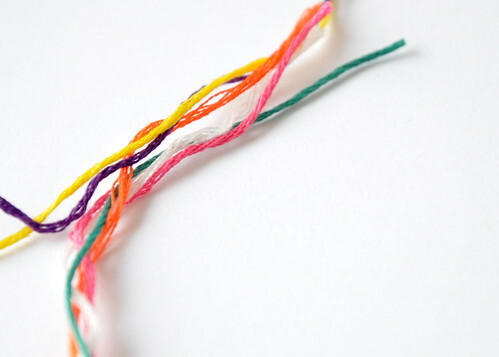 Make a knot when finished with one color and with a needle thread the loose end under the embroidery floss covered part. 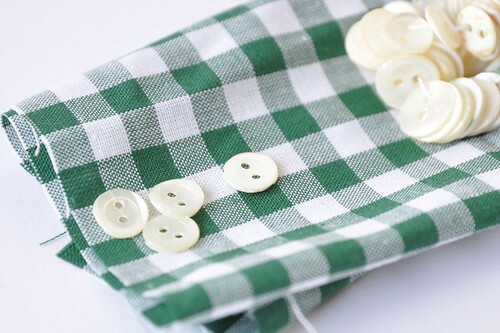 Next, sew on a couple of buttons, using different colors of floss. Finally, apply a tiny droplet of glue to all knots and loose ends, and to back of the buttons, to secure. Done! 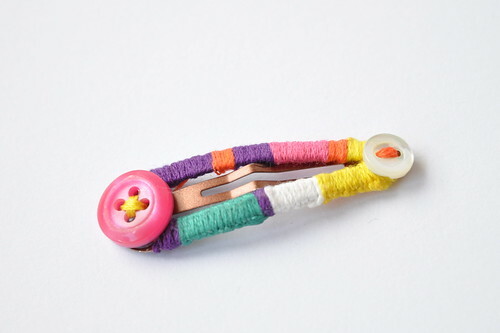 Proceed in pretty much the same way as for the bobby pin - however, instead of winding the floss around the clip, use a blanket stitch. If you can't sew on the buttons, glue them on (the use of a hot glue is recommended here, as one of my buttons fell of with regular crafts glue). This is as fancy as it gets when it comes to hair styles and accessories at our place. I have no talent or what so ever when it comes to styling hair. I'm afraid I'll have to disappoint my sweet girl M. as I really don't see how I could make her hair look like this hairstyle she'd spotted on One Pretty Thing... I wonder if a green and white hair clip would do?